Introduction/Background: Achalasia is an esophageal motility disorder characterized by impaired relaxation of the lower esophageal sphincter. Although it typically presents with dysphagia, more advanced cases can result in weight loss, regurgitation, pneumonia, left atrial obstruction, cardiac arrhythmias, and airway obstruction. We report the case of a 47 year-old female with advanced achalasia resulting in megaesophagus (Image 1). She was originally diagnosed over 25 years ago and declined esophagectomy 5 years ago. Her conditioned worsened and she required multiple hospital admissions for dehydration. She underwent an attempted endoscopy one month ago, however, the procedure was aborted as food debris in the esophagus prevented passage of the endoscope. Attempts to clear the esophagus with suction during the procedure were unsuccessful. The patient ultimately presented for Ivor Lewis esophagectomy. 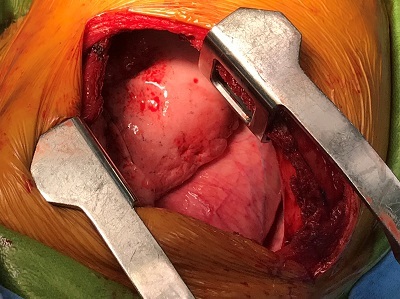 On pre-operative evaluation, the patient noted she was unable to lay flat without regurgitating food, experienced shortness of breath, and had limited oral intake. Her medical and surgical history were otherwise notable only for hypothyroidism controlled with levothyroxine. Methods: Given the advanced nature of the patient’s disease and risk of aspiration, awake fiberoptic intubation was planned. The patient was pre-treated with glycopyrrolate 0.2 mg IV. Airway topicalization was performed with nebulized 4% lidocaine and 5% lidocaine ointment applied directly into the oropharynx. Shortly after beginning topicalization, the patient had numerous episodes of emesis. An attempt was made to pass the flexible videoscope, however, the patient had not yet achieved complete topicalization and intubation of the trachea was unsuccessful. Topicalization was therefore suspended until oropharyngeal sensation returned and emesis subsided. We subsequently proceeded with rapid sequence induction. The patient’s head of bed was kept at 30 degrees. She was induced with propofol 2 mg/kg and succinylcholine 2 mg/kg while cricoid pressure was applied. Her trachea was successfully intubated on the first attempt with videolaryngoscopy. 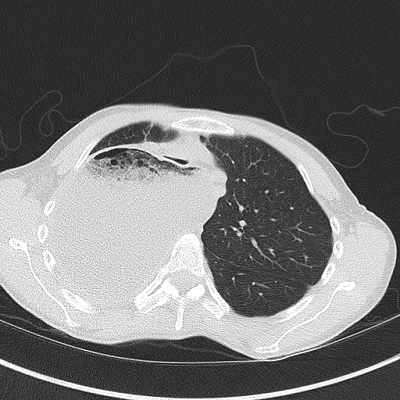 Results: After securing the patient’s airway, lung isolation was achieved with a bronchial blocker. The patient tolerated lung isolation without difficulty. The surgical procedure (Image 2) was uncomplicated and the patient was extubated in the operating room before transfer to the intensive care unit. The patient’s post-operative course was overall unremarkable. She began tolerating an oral diet on post-operative day 5 and was discharged home on post-operative day 10. Discussion/Conclusion: Awake fiberoptic intubation is often considered the gold standard for management of high risk airways, and some recommend it for advanced achalasia. Our patient’s regurgitation when laying flat made us highly concerned for aspiration if she were induced without a secure airway. In addition, the debris in her esophagus was known to be difficult to clear. Unexpectedly, the patient was unable to prevent emesis after topicalization. We were ultimately successful in securing her airway with rapid sequence induction followed by videolaryngoscopy. This case demonstrates that awake fiberoptic intubation may not always be the safest option and highlights the potential risk of oropharyngeal topicalization in the setting of megaesophagus.